A recent report published by Infinium Global Research on FPSO market provides in-depth analysis of segments and sub-segments in global as well as regional FPSO market. The study also highlights the impact of drivers, restraints and macro indicators on the global and regional FPSO market over the short term as well as long term. The report is a comprehensive presentation of trends, forecast and dollar values of the global FPSO market. According to the report, the global FPSO market is projected to grow at a CAGR of 12% over the forecast period of 2018-2024. Floating Production Storage and Offloading vessels, or FPSOs, are offshore production facilities that stock both processing equipment and storage for produced hydrocarbons. Floating Production Storage, Offloading has become the primary method for many offshore oil and gas producing regions around the world. An FPSO is a floating production system that receives fluids such as crude oil, water and a host of other things from a subsea reservoir through risers that then separate fluids into crude oil, natural gas, water, and impurities within the topsides production facilities on the ship. The main advantage of FPSO is reduced sincere investment and retained value as they can be relocated to other fields. FPSOs are especially useful in newly established offshore oil regions where there is no pipeline infrastructure in place, or in remote locations where building a pipeline is cost-prohibitive. The oil and gas companies have pushed the exploration of oil and gas from onshore and offshore areas, which is driving the growth of the FPSO market. 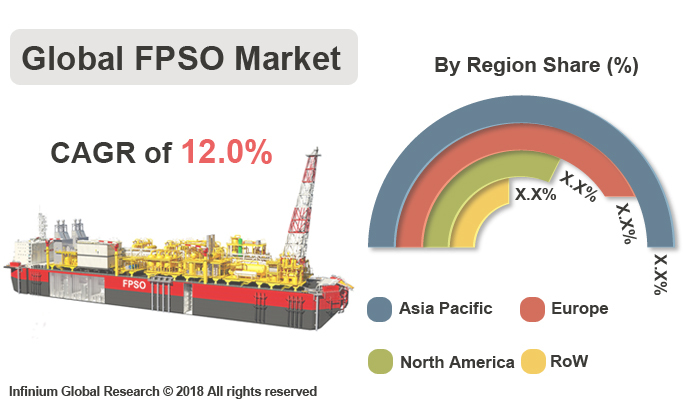 In addition, FPSOs have also become more popular in the oil industry because of their lower cost relative to traditional offshore oil platforms. The demand for FPSO is anticipated to rise owing to the expansion in the oil and gas industries along with the incentives that are supported by the government that is boosting the growth of the FPSO market. However, construction and building of new FPSO require a high initial investment, which is the restraining factor for the growth of the FPSO market. Furthermore, demand new-build and converted FPSO vessels have increased due to the declining rate of new onshore oil discoveries to historic low levels and from technology that enables efficient deep-water oil exploration in extraordinary ocean depths. This, in turn, is providing huge growth opportunities for the key players in the FPSO market. Among the geographies, South America dominated the FPSO market. The growth in the FPSO is due to the huge investment in the upstream activity related to reserves of hydrocarbons. Moreover, the National Oil Company of Brazil, Petroleo Brasileiro (Petrobras) has the most constructive plans for the development of the country's sub-salt hydrocarbon resources in the Santos and Campos basins through FPSOs. Expansion in the FPSO market in Brazil is attributed to the increased investment in the exploration of deep-water areas. The report on global FPSO market covers segments such as product type and carrier type. On the basis of product type, the global FPSO market is categorized into oil, LPG and LNG. On the basis of carrier type, the global FPSO market is categorized into a converted ship, new build ship and redeployed. The report provides profiles of the companies in the global FPSO market such as MODEC, Inc., SBM Offshore N.V, BW Offshore, Bluewater Energy Services B.V, Bumi Armada Berhad, Yinson Holdings Berhad, and Teekay Corporation. The report provides deep insights on demand forecasts, market trends, and micro and macro indicators. In addition, this report provides insights into the factors that are driving and restraining the global FPSO market. Moreover, IGR-Growth Matrix analysis given in the report brings insight into the investment areas that existing or new market players can consider. The report provides insights into the market using analytical tools such as Porter's five forces analysis and DRO analysis of FPSO market. Moreover, the study highlights current market trends and provides forecast from 2018-2024. We also have highlighted future trends in the FPSO market that will impact the demand during the forecast period. Moreover, the competitive analysis given in each regional market brings insight into the market share of the leading players. This report will help manufacturers, suppliers, and distributors of the FPSO market to understand the present and future trends in this market and formulate their strategies accordingly.